Don’t forget to catch heavyweight champ Brock Lesnar and Cain Velasquez in tonight’s debut of “UFC Primetime: Lesnar vs. Velasquez.” The first of the three-part series airs Wednesday night on Spike TV at 11PM ET/PT. The final two episodes will be shown on successive Wednesdays, October 13th and 20th. 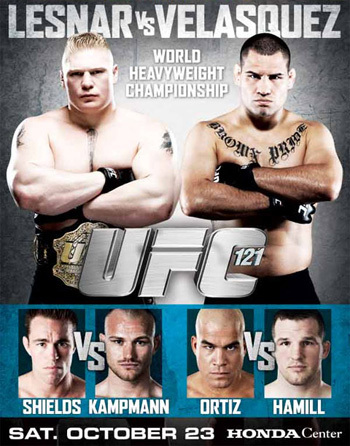 Lesnar is coming off a come-from-behind victory over Shane Carwin at UFC 116. The former pro wrestler was on his heels after being hurt badly by the heavy handed Carwin in the opening round, but managed to rally and unify the heavyweight title. Velasquez is looking to capitalize on the most impressive win of his young career after stopping MMA legend Antonio Rodrigo Nogueira in his tracks at UFC 110 in Australia. The event marks the Octagon’s long awaited return to the Southern California area, as Anaheim’s Honda Center will host the October 23rd extravaganza.